and the Jefferson Blend, a more traditional black tea with hints of Bergamot. 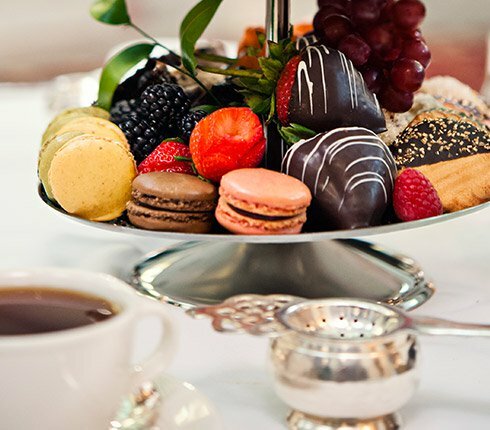 ​The price for the Chocolate Lover's Afternoon Tea is $51.80 including all taxes, gratuity, and parking. You may utilize our valet parking services, which is complimentary for our tea guests. Any specialty items ordered outside of the set menu would incur additional charges. We ask that all ALLERGIES, FOOD RESTRICTIONS, and special DIETARY NEEDS be communicated at least ONE WEEK PRIOR to the reservation. There is a $6 UPCHARGE FOR A GLUTEN FREE MENU and a $4 UPCHARGE for any RESTRICTED MENU (peanut or dairy free). You will have two hours to enjoy your celebrations. Final date to register: Friday, February 1, NOON. regardless how many may show, so there will be no cancellations after February 1. Please make your check payable to St. Giles and note "Chocolate Lover's Tea" in check memo. ​You may give your check to Patience Flynn or place in the offering plate Sunday. Tuesday Bible Study - Jen Wilkin's exciting study God of Creation. To order book, see Jane Harler or call the church office. Grandmother's Prayer, Group #1 - Meets the Second and Fourth Wednesdays monthly at the home of Becky Shepherd at 2 PM. Closed at this time to new members. Grandmother's Prayer, Group #2 - Meets the Second and Fourth Wednesdays monthly at the home of Bev Walters, 10:30 AM. Open to new members. First Thursday Morning Book Club - Meets first Thursdays of each month at 10 AM at Crossroads Coffee and Ice Cream. Open to all. ​Lost and Found Circle - Meets Second Thursday of each month, 6:30 PM at the home of Marion Slater. Call church office for details. The 2018 Women's Retreat, held at Chanco on the James April 13-14. Evelyn Haycocks of Winchester, Virginia was an inspirational speaker, reminding each woman she carries the "essential oil" of the spirit wherever she goes. ​with your sisters in Christ!